The Bonner Milltown History Center news letter just arrived and as usual it is a good read. The feature article “The Red Rubber Tire” is a look back at the old red rubber Armstrong tires. Supporting this group through donations or even just attending the events they host is a worthwhile use of your time and money. The group has offices, museum and collections in the Bonner Post Office Building, a historic structure that is a contributing resource to the Bonner Historic District. Coffee and cookies are served every Tuesday morning 9:30 to 11:30 and you can be sure that good conversation and tales about Bonner history will also be served. The BMHC was established in 2009 and they are a volunteer organization dedicated to the preservation and interpretation of the Bonner Milltown area’s lengthy and colorful history. Their collections and interpretation efforts include the forest industry, the Bonner Millsite, the Milltown dam, local railroad history, and the ethnic, commercial, and social institutions that defined this early and significant community. Judy Matson and Minie Smith, two of the driving forces behind the BMHC are past recipients of the Missoula City Historic Preservation Commission’s prestigious Dorothy Ogg Award for Excellence in the Area of Individual Contribution to Historic Preservation. It has been suggested publicly that if we could distill the essence that drives these two and sprinkle it around other historic preservation groups there would be a lot more success in the historic preservation world. The History Roundtable for January 27, 2013 program will be “A Salute to Our Veterans” at 2:00 pm at Our Savior’s Lutheran Church in Bonner. The roundtable discussions are always interesting and always well attended. Mark the date on your calendar. The February roundtable will feature local railroads and the topic for March is being developed. You can contact the BMHC through their website, email or on Facebook and even by regular old mail. Their website is www.tworivershistory.net and their mailing address is PO Box 726, Bonner, MT 59823. We encourage you to show support for the excellent work that the BMHC accomplishes through donations of your time and money. 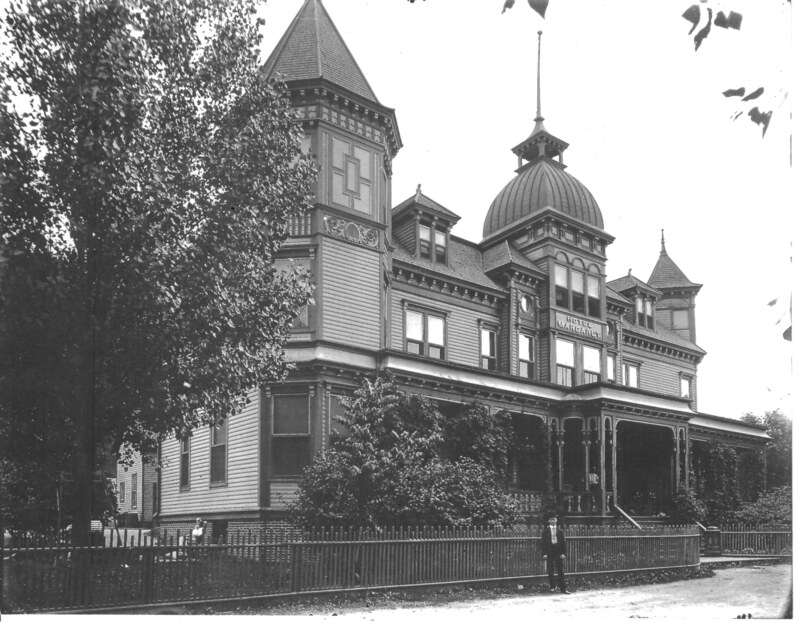 The Hotel Margaret, the grand dame of Bonner as she appeared in 1910, photograph from the Bonner National Register of Historic Places Nomination Form.